The boarding section of Ermitage has been a home for hundreds of students throughout the years. They have all had the chance to live and learn in a safe, cozy and supportive environment, where every student is given the attention they deserve. 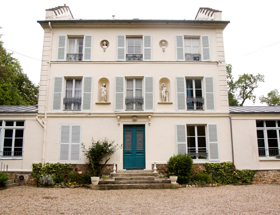 Our boarders have the privilege of living in a beautiful town, only 20km from Paris, surrounded by acres of forests. The historical buildings that make up the school and Maisons-Laffitte are a constant reminder of the cultural and historical background of the area. We encourage all our boarders to become part of our family and also active members of this community. Paris at your doorstep… Museum visits, movie nights, shopping, and sightseeing will be offered to students during weekends. This gives our students the opportunity to discover one of the most beautiful cities in the world while building team spirit. Maisons-Laffitte offers our students an opportunity to explore everything they could need for a wholesome lifestyle; culture, sports, and fun! The Maisons-Laffitte Sports Union (USML) offers a wide range of community sports, from Football, Rugby, and Basketball, to Rowing, Fencing, and Martial Arts. Maisons-Laffitte is also famous for its horseback riding! Maisons-Laffitte also has many dance and music studios, keen on welcoming our boarders in the evenings during the week or on weekends. Both 5-day and 7-day boarders live in charming, historic homes, surrounded by gardens, forests, and always a stone’s throw away from the school's classrooms and facilities. Each home is unique and equipped with kitchenettes and study rooms, with bedrooms shared between 2-4 students, depending on layout.